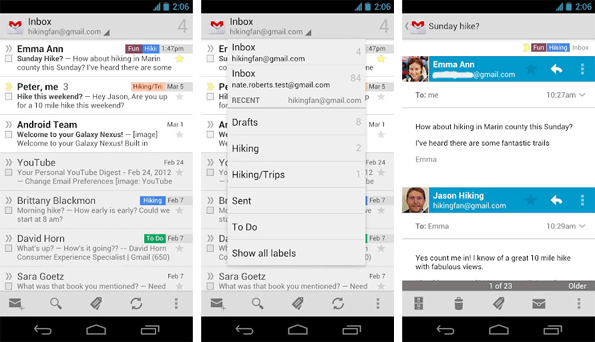 Here are the best Email Apps for Android. There’s nothing really WRONG with the default Android email client. I’ve used mine for years without any real complaints, and chances are you have too. The problem with people like us is that we don’t really know what we’re missing. There are indeed some very good email apps for android out there that make the default email look a bit weak by comparison. The only thing to keep in mind is the question “what do I need my email client to do?” Well, there’s another question, which is “how much am I willing to pay for an email client to do what I want it to do?” Some of these Email apps for android aren’t free, which may limit their appeal to many of us. But otherwise, feel free to select for any of the five that meet your specific needs. Hands down, K9 is the single most popular alternative email client. A constantly-improving open-source project, K9 Mail is already good enough to achieve millions of downloads and a near-perfect rating. Features include: unified Inbox, extensive customization including gesture control, POP3, IMAP (including IDLE), Exchange 2003/2007 (webDAV) and Gmail support, smart search, message handling (archive, star, spam, draft. trash). Okay, so there’s no message threading, and the Exchange support won’t quite meet all of your BYOD needs. But it’s worth far more than the free download might indicate. 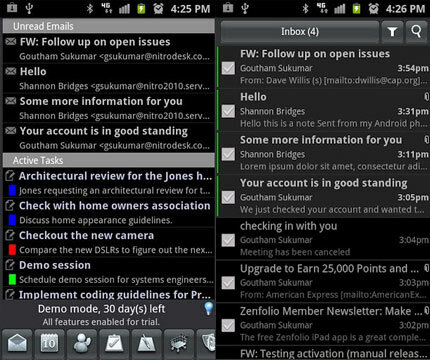 One of the best email apps for android. If you need ActiveSync and/or Exchange Server (up to 2010), Touchdown should be at the top of your list. The corporate focus means that Touchdown is far more BYOD-ready than most, offering security features such as PIN lock, encryption, remote administration (up to and including device wipe), S/MIME, and complete separation from your personal phone system. Exchange allows you to push calendar, contacts, and tasks, as well as syncing notes and SMS. Plus, you’ll get widgets for email, calendar, tasks, and more. Good news: there are versions specifically for “HD” tablet displays, as well as for “Not so smartphones.” Bad news: it costs $20 for the unlocked version once the trial period expires. 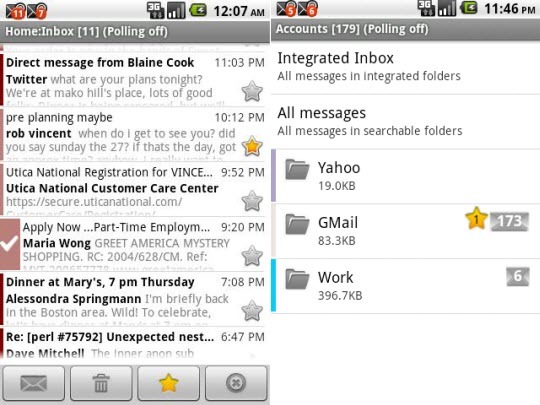 Probably second only to K9 in popularity, MailDroid offers POP3 IMAP (including IDLE), Exchange 2003/2007 and Gmail support, with a clean, intuitive, and surprisingly responsive interface. Features include a unified inbox, bookmarks, cache-assisted search, custom rules, on-and-offline composing with the full WYSIWYG editor. Least favorite thing? The free version is ad-supported (with all of the permissions and battery drain that comes along with ads) and the full version is $17.99, which makes it difficult to recommend unless you’re absolutely in love with it. 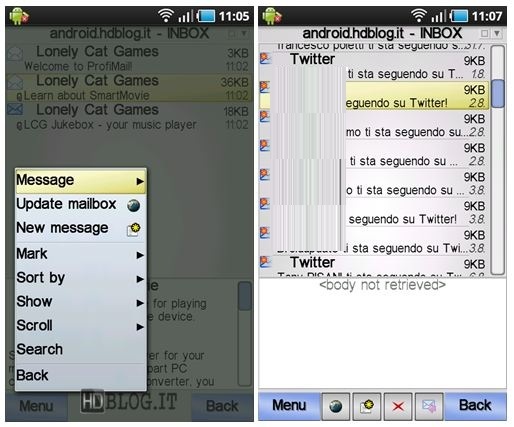 Appearing on a surprising amount of favorite lists, ProfiMail is essentially unchanged from its Symbian roots. ProfiMail offers webmail, SMTP, POP3, and IMAP support (including IMAP folders and IDLE), an integrated image, text, HTML, zip, and Word viewer for full attachment control, rules-based filtering, smart search, unified inbox. Cons: buggy (up to and including freezing) when offline. 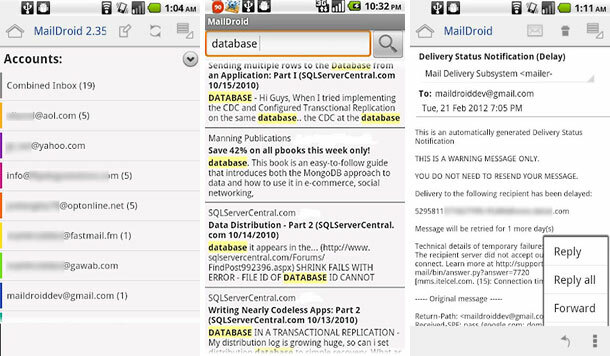 And at $24.99, you’d have to love it even more than MailDroid users love MailDroid, which is somewhat unlikely. If you do a majority of your work via Gmail, Hotmail, or Yahoo! Mail, you’ll want to keep the dedicated client simply to access multiple accounts, chat functions, or any of these client’s unique features, not all of which are mirrored by these email alternatives (or, to be fair, the default Android email client). Considering that you have an Android phone, you should be taking advantage of the free Gmail account that will be attached to it. And if you’ve been using Yahoo! or Hotmail for years, there’s no reason to stop, and little reason to try to configure an all-in-one client that will make you learn how to do it all over again. If you know more best email apps for android then share with us via comments below.